As children, we may learn about the Three Sisters—squash, corn, and beans—during elementary school explorations into American Indian life. The cultivation of the Three Sisters represented ingenuity in sustainable agricultural practices. For the Iroquois, the Three Sisters were the spiritual sustainers of life, providing complete vegetarian protein. With an understanding of the challenges facing this population and an awareness of the programs that are making a difference by emphasizing traditional foods and physical activity, nutrition professionals can help address the health disparities affecting American Indians. The spiritual value of food, as well as its use as positive reinforcement, has both positive and negative impacts on many American Indian communities. Food is respected as nourishment, but it may also be used for “rewarding children with foods such as candy, bakery sweets, pop, and ice cream that were restricted when the parents themselves were young children in extreme poverty and didn’t have access to such foods and beverages,” notes Karen Strauss, MS, a retired dietitian with 20 years of experience in the Indian Health Service. Given this reality of severely underfunded healthcare services, the need to focus on preventive healthcare measures (eg, healthful eating, exercise, routine care) becomes all the more vital in American Indian communities. Strauss recommends that public health strategies “involve the community via coalitions or similar organizations in developing and implementing interventions” rather than imposing a vision of public health from an outsider’s perspective. Local culture and traditions should be integrated into any public health policy by accounting for the diversity of beliefs and traditions among American Indians. Like many communities in the United States, many American Indian tribes have undergone nutrition transitions whereby chronic diseases are becoming more prevalent. According to one study in the August 2006 issue of Diabetes Care, when comparing two groups of Pima Indians with similar genetic makeups—one in traditional environments in Mexico and the other in Western environments in the United States—the prevalence of type 2 diabetes was overwhelmingly higher among Pima Indians in the United States. With many American Indians adopting a sedentary lifestyle typical of rural America, the lack of physical activity and oversupply of fatty, sugary foods has become a recipe for disaster. With American Indian families ill equipped with financial resources, parenting support, and access to healthful foods, current generations of American Indians are struggling with obesity and prediabetes. Despite categorizing American Indians as part of the same racial or ethnic group, American Indian tribes are not all the same—not in culture or even in diabetes rates (with some at 5% and others at 33%).7 Therefore, interventions must be uniquely planned and implemented with the individual situations in mind. The focus should be on prevention with cultural competency at the heart of these programs. Many efforts have focused on preventing diabetes and obesity in American Indian communities by promoting the consumption of local and traditional foods. In her book Recovering Our Ancestors’ Gardens: Indigenous Recipes and Guide to Diet and Fitness, Devon Abbott Mihesuah, PhD, a historian and member of the Choctaw Nation of Oklahoma, asserts that fry bread and Indian tacos are not traditional fare. While many American Indians have grown up eating these foods, Mihesuah points out that traditional American Indian diets did not include wheat or dairy products. Fry bread, like other foods made from wheat, came from the federal commodity food program, which provided surplus white flour, cheese, sugar, lard, and canned foods to American Indian reservations. By contrast, traditional American Indian diets featured a wide range of meats, vegetables, fruits, and herbs. Some traditional foods popularly appeared in Thanksgiving dinners—for example, turkey, corn, green beans, potatoes, squash, cranberries, pumpkin, and beans—and the variety of foods did not end there. Walnuts, avocados, red and yellow bell peppers, strawberries, cactus, guava, papaya, and artichokes are all indigenous to the Americas. American Indian tribes also included wild plants such as dandelion, elderberry, mint, purslane, and watercress in their diet. Community-based organizations such as Tohono O’odham Community Action in Sells, Ariz., are taking steps to promote healthful lifestyles among American Indians. In 2000, Tohono O’odham Community Action helped organize the Desert Walk for Health and Heritage, a march that lasted more than a week and took participants more than 200 miles from El Desemboqute, a Mexican village on the Sea of Cortez, across the Sonoran Desert to Tucson, Ariz. The aim was to raise awareness of healthful, traditional foods, particularly as a solution to the diabetes epidemic that has affected one-half of Tohono O’odham adults,8 through the revival of a heritage walk traditionally undertaken by young Tohono O’odham men. During the event, walkers ate stewed nopalitos (cactus pads), mesquite and amaranth pancakes with prickly pear syrup, and punch made with ocotillo flowers. Tohono O’odham Community Action is currently working with the Indian Oasis-Boboquivari School District to improve the nutritional quality of meals by serving students healthful, local, and traditional foods. Teachers are also trained to use lesson plans that promote traditional foods and healthful eating through garden-based activities. Urban health centers are also addressing nutrition disparities among American Indians. (Contrary to popular belief, almost two-thirds of American Indians and Alaska Natives reside off reservation in metropolitan areas.9) One urban effort to improve American Indian health is the Running Is My High event hosted by the Native American Health Center in Oakland, Calif. The annual event celebrates sobriety and wellness by bringing back the tradition of running among American Indians. In addition, the American Indian Health Service of Chicago offers The Healing Circle, a community diabetes program for urban American Indians. The program provides outreach screenings, educational sessions, and home visits to promote the prevention and management of diabetes while linking community members to medical care at the clinic. Dietitians can also do their part to make a difference in improving the health of American Indians. Strauss recalls an overweight patient in his late 20s who had recently been diagnosed with diabetes. “As a clinical dietitian, I always looked for one, maybe two often-eaten foods that could quickly make a difference to blood sugar levels,” she says. Following a now-common practice in American Indian communities, this man consumed a large amount (1 liter) of soda per day. “My only recommendation that day was for him to switch to water or diet soda.” On his return visit, his blood sugar had dropped to normal levels. The young man continued to meet with Strauss weekly, and she became his friend and partner in nutrition care. On subsequent visits, he seemed thrilled to show Strauss his progressively smaller waistline. Strauss offers some advice: Dietitians considering offering consultant nutrition services to American Indian communities should become involved in the community and get to know its people. “Clients may be reluctant to keep appointments with a dietitian they consider an outsider,” she says. RDs should also learn about the history and the challenges in the community in which they are working. While serving as the nutrition authority, they should take a collaborative rather than an authoritarian approach, serving as an advisor and friend, not the all-knowing professional. Dietitians can best work with the American Indian community by advising or loosely leading community coalitions and advisory groups. They should also withhold judgment when the social and cultural characteristics of a community or family are not consistent with their own personal experiences and ideals. In attempts to bridge this gap, the Southwestern Dietetic Internship Consortium prepares dietetics professionals to work in both urban and rural American Indian communities. Its goals are to improve American Indians’ access to nutrition care with a qualified dietetics professional and increase the number of American Indian dietitians. In addition, the Multicultural Scholars in Dietetics Program at the University of North Dakota offers financial assistance to undergraduate students majoring in dietetics or community nutrition. Addressing health disparities takes a socioecological approach. Culturally appropriate food services, nutrition education and medical nutrition therapy, school gardens, and farm-to-school initiatives all have important roles to play in tackling the epidemic of obesity and chronic disease among American Indians, as they do in all communities across the United States. While many see a return to tradition as the best way to combat diabetes and obesity, Mihesuah and others advocate for combining the best of the old and new, such as choosing traditional American Indian ingredients and adding healthful foods and flavors from other continents. Someone could put a twist on the Three Sisters stew by combining the traditional lima beans, yellow squash, and hominy corn and adding a bit of olive oil, thyme, and fresh homegrown cilantro. Such a tasty meal both preserves long-held traditions and allows new ingredients to make a healthful impact. — Elaine Kovacs, MA, is currently pursuing her master’s degree in social work while working in Austin, Tex. 1. Henry J. Kaiser Family Foundation. Overweight and obesity rates for adults by race/ethnicity, 2009. Available at: http://www.statehealthfacts.org/comparetable.jsp?ind=91&cat=2&sort=137. Accessed April 10, 2011. 2. Centers for Disease Control and Prevention. American Indian & Alaska Native populations. Updated November 30, 2010. Available at: http://www.cdc.gov/omhd/populations/aian/aian.htm. Accessed March 1, 2011. 3. Gundersen C. Measuring the extent, depth, and severity of food insecurity: An application to American Indians in the USA. J Popul Econ. 2008;21:191-215. 4. Edwards K, Patchell B. State of the science: A cultural view of Native Americans and diabetes prevention. J Cult Divers. 2009;16(1):32-35. 5. Indian Health Service. Facts on Indian health disparities. January 2006. Available at: http://info.ihs.gov/Files/DisparitiesFacts-Jan2006.pdf. Accessed March 1, 2011. 6. Sarche M, Spicer P. Poverty and health disparities for American Indian and Alaska Native children: Current knowledge and future prospects. Ann N Y Acad Sci. 2008;1136:126-136. 8. Unnatural Causes: Is Inequality Making Us Sick [DVD/VHS]. San Francisco: California Newsreel; 2008. 10. University of North Dakota College of Nursing. Multicultural scholars into dietetics program (MSDP). 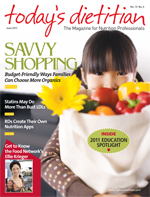 Available at: http://www.nursing.und.edu/nutrition-dietetics/msdp.cfm. Accessed April 10, 2011.